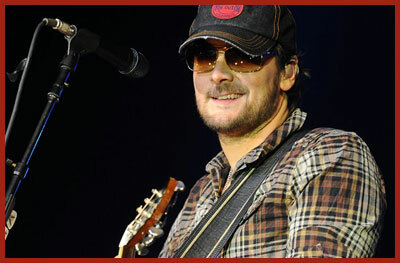 Born and raised in Granite Falls, North Carolina, Eric Church began writing songs of his own at 13 with a guitar he purchased. During his senior year of high school he found a gig at a local bar which occupied most of his time. For a few years he played in bars and restaurants throughout North Carolina. He graduated from Appalachian State University and soon went to Nashville. He started recording with different producers and Capitol Nashville. Some of his earlier hits are “Guys Like Me” and “Love Your Love The Most”. In 2010 he moved to EMI Records Nashville becoming their second artist. “Drink In My Hand” became his first Number 1 single followed by “Springsteen”. Some other of his hits are “Smoke a Little Smoke”, “Homeboy”, “Creepin’”, and “Like Jesus Does”. In early 2014 he released “Give Me Back My Hometown” it went on to become his fourth number one hit. Eric is described as Outlaw Country. He is known for his aviator sunglasses and denim Von Dutch trucker hat.